Other people have the ability to wow us with their brilliance and inspire us with their capabilities. Other people have the ability to notice us when we’re having a bad day and help to lift us up. Other people have the ability to lead the way when times get tough. Other people have the ability to stand out from the crowd and be the voice of reason when everyone else is full of fear. Other people take the time to read, learn and grow, so that they have something positive to share, teach and equip us with. It’s easy to leave all of the heavy lifting to other people, giving them the sole responsibility for making the world a better place. But to someone else, you’re other people. 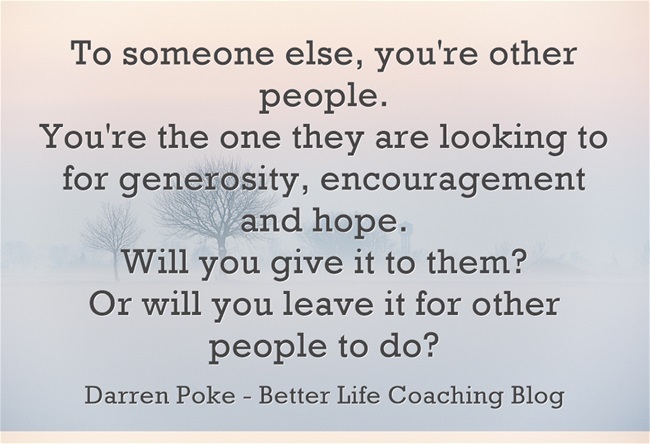 You’re the one they are looking to for generosity, encouragement and hope. Or will you leave it for other people to do?